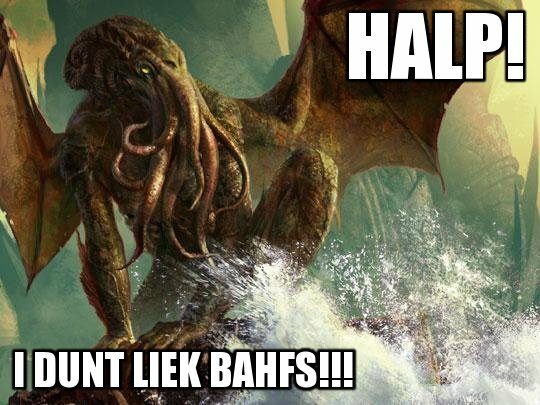 LOLTHULHU » HALP! I DUNT LIEK BAHFS!!! HALP! I DUNT LIEK BAHFS!!! 6 Responses to HALP! I DUNT LIEK BAHFS!!! Ha ha, only great Azathoth can help him now. U has bukkit to save C’thulhu? Me:No… but I has patchouli soap! C’thulhu: A hippie? How could this be?How could there be a life form greater than me? Me: It’s easy, all you need is love!